We set alarms for 3, 3:15, and 3:30, and by 4 a.m. we had begun our flashlight-lit walk from Aguas Calientes to Machu Picchu. It was a steep climb of about 1700 very uneven stairs (Ken counted), and at 5:15 or so, as the sky lightened, we were among the first 50 people to arrive at the entrance gate. We had our tickets stamped and received our passes (only 400 are distributed daily) to climb Waynapicchu, a mountain with literally breathtaking views of the ancient Incan city. 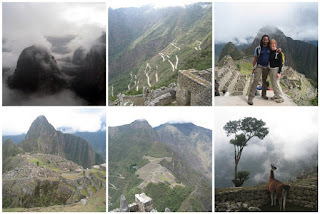 At about 6:30 we began a two-hour tour of Machu Picchu with Enrique, then Ken and I set off to climb Waynapicchu. For me it was one of the most difficult parts of our trip. The "steps" were steep and uneven, and to get to the top took almost an hour. It was worth the effort. I stopped at a plateau near the top and Ken continued another 10 minutes or so to the peak. While I sat waiting for him in the sunshine, overlooking Machu Picchu, I felt incredibly peaceful. We arrived back in Cuzco late Wednesday night and spent most of yesterday scratching our bitten legs and resting our tired feet. Today we treated ourselves to hour-long massages at the bargain-basement price of $7 each, then had lunch at the central market, where a huge bowl of soup and a generous portion of rice, salad, lentil stew, and fried fish costs all of $1. Including a glass of juice. On Wednesday I swore it would be weeks or even months before I did another trek, but today I'm reconsidering. After all, in life, as in Peru, anything can happen, but nothing is for sure. So beautiful! I want to do this one day!